American Dill, Aneth, AnethiFructus, AnethiHerba, Anethumgraveolens, Aneth Odorant, Anethumsowa, Dill Herb, Dill Weed, Dillweed, Dilly, European Dill,FenouilBâtard, FenouilPuant, Huiled’Aneth, Indian Dill, Madhura, Satahva, Shatpushpa, Sotapa, Sowa. Dill weed is an annual plant with a short life used to spice up meals and as an ingredient in some medications. The ancient Romans believed that dill is mysterious, miraculous power. Fresh fennel has a strong aroma and sweet, peppery flavour. German cooking frequently uses it as a part of dishes showcasing fish, eggs, cheese and poultry. It is used as a part of courts-bouillons and sauces for salted salmon, fish, salted salmon, soups and goulashes. Itenhances admirably in yoghurt sauces and sour cream. Frequently used with shrimp, green beans, trout and salmon, devilled eggs, cream cheese, cauliflower and beets. Mainly used to flavour various pickles and crayfish cooking liquid. Dill weed gives a good source of vitality and helps in digestion trough healthy fatty acids. Help antioxidant elements attach to oxidised parts that would otherwise harm the body. Dill weed has been appeared to battle bacteria and fungi and other infections caused by them. The essential oil of dill weed is powerful against bacteria strains. Dill weedanalgesic and antidepressant effects. May bring down menstrual symptoms. During the medieval period, people were used dill held tight on the doors to keep witches far away from homes. In the past, dill was also used as an element of magic potions. Rises from 30 to 120 cm in height. The whole plant is smooth and fragrant. The leaves are thread-like. The flowers are yellow and grow at 6 to 10mm long handles, radially symmetrical and five-part. It blooms from May to August. The fruits are ovoid, brown, 3 to 5 mm long and 2 to 2.5 mm wide. The fruit ripens from July to September. The seeds of the plant are mature when it starts to darken and can then be harvested. 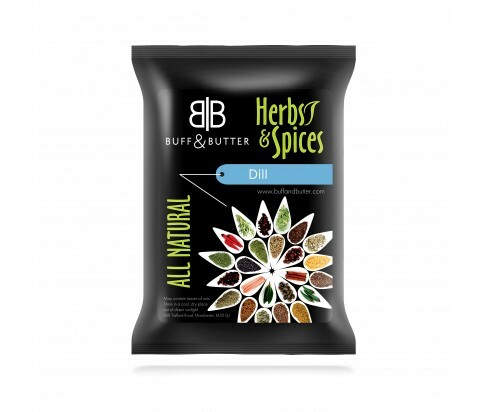 The dried dill weed is conveyed from the dried seeds of the plant and fine crushed.